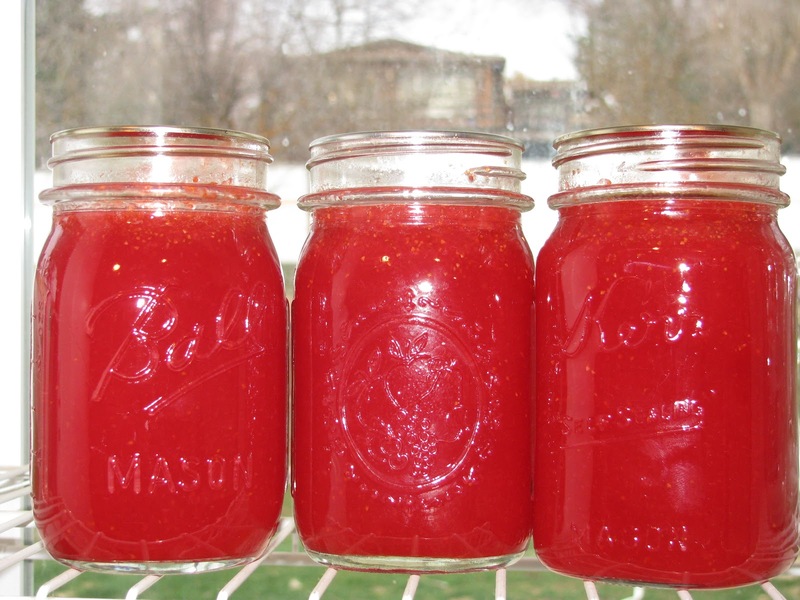 Strawberries and Summer - Strawberry Lemonade Concentrate - Canning Homemade! When I think of summer and how busy I get with canning I forget sometimes about the hours we spend in our backyard enjoying the weather. Last year wasn't the "warmest" of summers here in Santa Barbara. Troy and I decided last summer that we were going to stop buying Crystal Light peach tea mix since the price kept going up and decided to brew our own iced tea using tea bags. So much cheaper and ultimately we could control the sugar or type of sugar we added. It's been a great change but would love to add something different again this summer to our afternoon and meal beverages. We don't have soda in the house now for about five years but a post to my Facebook page gave me some inspiration. PJ posted an amazing jar and I was loving the color before I even asked what recipe she had made. The bright color reminded me of Miranda's Cinnamon Red Hot Appples. When she told me it was the Strawberry Lemonade Concentrate from the Ball Complete Book of Home Preserving I was very excited. I had passed by all the recipes for "concentrates" thinking they would be sweet and probably not very popular in my house, but after asking a few questions of my family I decided to add it to my list. I looked at the recipe last night and found it very simple to put together. The mixture of the concentrate was a good ratio and the book used soda water or ginger ale as the mixer. I will have to figure out which works for us but I am hoping that good ole fashion water will taste just as good. Now for a great gift idea for the holiday or a hostess gift for a summer bash you could give a jar of the Strawberry Lemonade Concentrate and a bottle of vodka, tequila, or light rum. From PJ: "I used 1 pint of concentrate to 3-4 pints of water and it was great." Thanks PJ for sharing your picture! In a food processor, blender or bullet puree strawberries in batches. Transfer strawberry puree to a stainless steel saucepan over medium-high heat. DO NOT BOIL. Add lemon juice and sugar and stir to combine.